Dr. Koszewski is certified by the American Board of Otolaryngology-Head and Neck Surgery and is an active member of the American Rhinologic Society and the North American Skull Base Society. He is fellowship-trained in rhinology and skull base surgery. He specializes in care of the nose and sinuses as well as tumors of the cranial base and pituitary gland. His specific areas of expertise include complex or revision sinus surgery, and endoscopic resection and reconstruction of the anterior skull base. He is a member of the multidisciplinary Skull Base Team at the University of Wisconsin and works closely with Neurosurgeons, Neuroradiologists, Endocrinologists, and other Otolaryngologists to provide comprehensive care for diseases of the ventral skull base. Dr. Koszewski provides a wide range of services including Endoscopic Sinus Surgery, Revision Sinus Surgery, Nasal Airway Surgery, Frontal Sinus Surgery, Draf Procedures / Modified Lothrop Procedures, Extended Maxillary and Sphenoid Sinus Surgery, Endoscopic Medial Maxillectomy, Turbinate Reduction, Septoplasty, Nasal Polypectomy, Pituitary Surgery, Resection of Benign and Malignant Tumors of the Nose, Sinuses, and Skull Base, Skull Base Reconstruction, Endoscopic Endonasal Approaches to the Skull Base and Pituitary Gland, CSF Leak Repair, Sphenopalatine Artery Ligation, Epistaxis Surgery, Nasal Cautery, Tonsillectomy, Adenoidectomy, Tracheotomy. 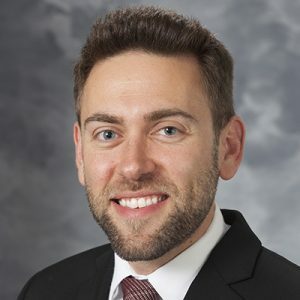 His research interests focus on innovating surgical techniques in skull base surgery, optimizing outcomes after sinus and skull base surgery, and improving multidisciplinary care. The Role of Free Tissue Transfer in the Management of Chronic Frontal Sinus Osteomyelitis. A cadaveric model for measuring sinonasal continuous positive airway pressure-a proof-of-concept study. Extent of Endoscopic Resection for Anterior Skull Base Tumors: An MRI-Based Volumetric Analysis.